In a recent monograph published by the U.S. Army War College’s Strategic Studies Institute, Dickinson College professor Douglas Stuart (who also teaches at the War College) heaps unalloyed praise on the Obama administration’s pivot to Asia and supplies it with a new name: Sustainment. 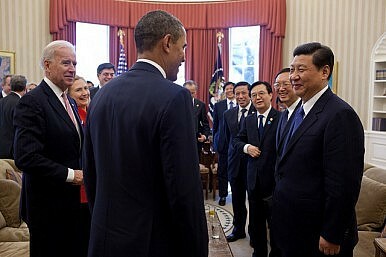 After praising Obama for his diplomatic efforts in the region (the Treaty of Amity and Cooperation with ASEAN, membership in the East Asia Summit, the Burma Policy Review, participation in the Asia-Pacific Economic Cooperation summit, the Pacific Islands Forum, the U.S.-China agreement on climate change), strengthening U.S. traditional alliances with Japan, South Korea, Australia, and Singapore, and beginning the shift of military resources to the region, Stuart identifies three schools of thought for dealing with a rising China: Containers, Adapters, and Game Changers. Containers, he writes, are influenced by the so-called “Thucydides Trap,” which warns that war is likely when a rising revisionist power challenges the status quo. He places international relations theorist John Mearsheimer in this category. Adapters focus on “U.S.-China economic interdependence” and urge U.S. policymakers to find common ground with China on international challenges such as climate change. Stuart places former Carter National Security Adviser Zbigniew Brzezinski in this category. Game Changers, such as Edward Steinfeld, expect China to become less authoritarian, more democratic, and more concerned with domestic problems than challenging U.S. preeminence. Stuart admits that all three schools of thought can point to evidence that supports their policy preference. His solution is for the U.S. to “pursue policies that are appropriate for each of the three points of view.” And it is here that Stuart’s policy of Sustainment looks uncomfortably similar to appeasement. Stuart, quoting Hugh White, proposes that the U.S. enhance its military presence in the region, but should “look for ways to ‘negotiate a new relationship with China as soon as possible, before the power balance shifts further China’s way.’” The enhanced U.S. military presence should “not precipitate Chinese insecurities.” The Pentagon, Stuart writes, should abandon those aspects of the Air-Sea Battle doctrine that are designed to destroy and defeat China’s anti-access and area-denial assets. Instead of taking sides on China’s disputes with its neighbors (some of whom are traditional U.S. allies) in the East China and South China Seas, Stuart proposes that the United States act as an “honest broker” to foster diplomatic solutions. There is no sense here that the United States has any strategic interests in the seas adjacent to China’s coast. Stuart mentions the frictions in U.S.-China economic relations, including the trade imbalance, Chinese copyright violations, and its currency manipulations, but urges U.S. policymakers to place “these areas of dispute … in context.” He further recommends that instead of emphasizing Chinese human rights violations, the U.S. should celebrate China’s extraordinary success in lifting so many people out of poverty. Finally, Stuart makes clear that U.S. policymakers must adjust to the proposition that their country will not remain the dominant player in the India-Asia-Pacific region. Thus the U.S. must find ways to effectively transition “from U.S. predominance towards a stable, more equitable balance of power in the Western Pacific.” Stuart takes it one step further by endorsing the notion that the United States must accommodate China’s globalized foreign policy even in Latin America—the Monroe Doctrine, he writes, is dead. Stuart’s proposed policy of Sustainment will not “sustain” or preserve America’s interests in the Asia-Pacific, and it will not reassure America’s allies of its long-term commitment to the region. Instead, it would reconcile the U.S. to what Stuart obviously sees as its inevitable decline, and pave the way for a rising China to replace the United States as the predominant power in the region and beyond. The full monograph can be downloaded here. Francis P. Sempa is the author of Geopolitics: From the Cold War to the 21st Century and America’s Global Role: Essays and Reviews on National Security, Geopolitics and War. He has written on historical and foreign policy topics for Orbis, Strategic Review, Joint Force Quarterly, The University Bookman, the Asian Review of Books, the New York Journal of Books, Presidential Studies Quarterly, the Claremont Review of Books, American Diplomacy, The Diplomat, and the Washington Times. He is an attorney, an adjunct professor of political science at Wilkes University, and a contributing editor to American Diplomacy.